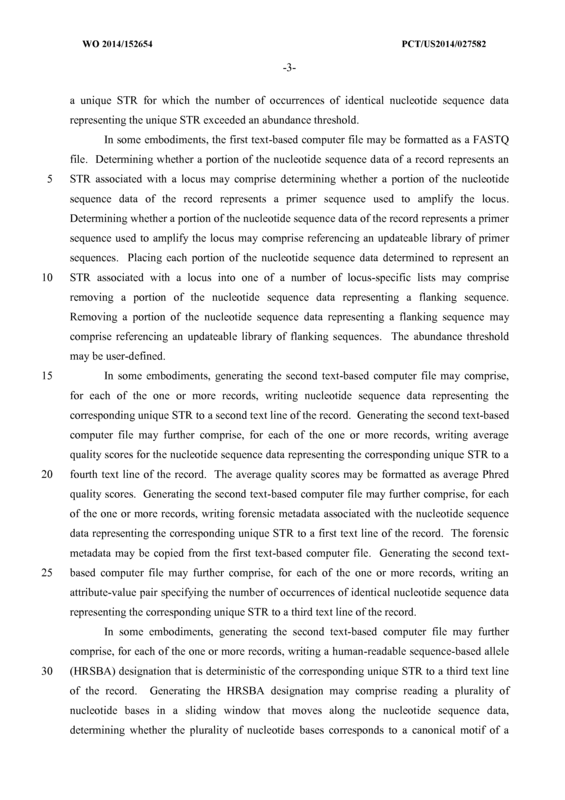 In one illustrative embodiment, a method may comprise receiving a first text-based computer file including one or more records, each of the one or more records comprising nucleotide sequence data generated by a read of a massively parallel sequencing instrument, determining whether a portion of the nucleotide sequence data of each record represents a short tandem repeat (STR) associated with a locus, placing each portion of the nucleotide sequence data determined to represent an STR associated with a locus into one of a number of locus- specific lists, determining a number of occurrences within each locus-specific list of identical nucleotide sequence data representing a unique STR, and generating a second text-based computer file including one or more records, each of the one or more records corresponding to a unique STR for which the number of occurrences of identical nucleotide sequence data representing the unique STR exceeded an abundance threshold. 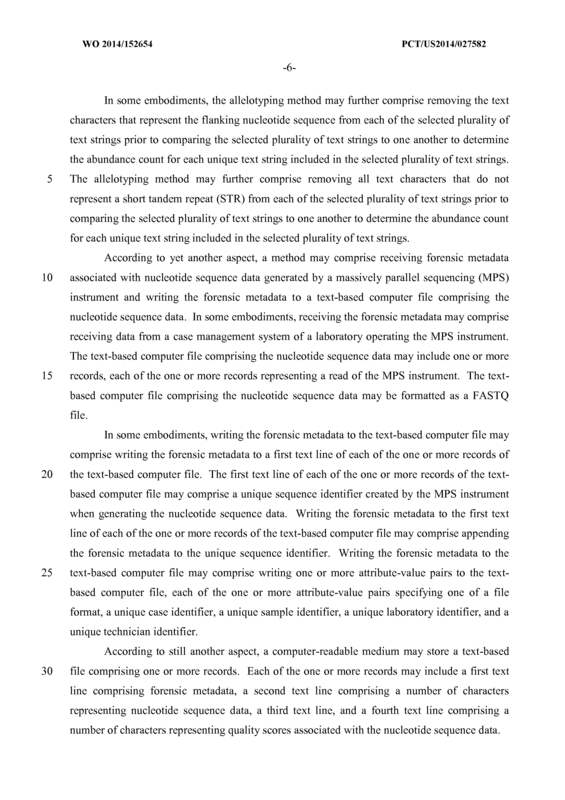 generating a second text-based computer file including one or more records, each of the one or more records corresponding to a unique STR for which the number of occurrences of identical nucleotide sequence data representing the unique STR exceeded an abundance threshold. 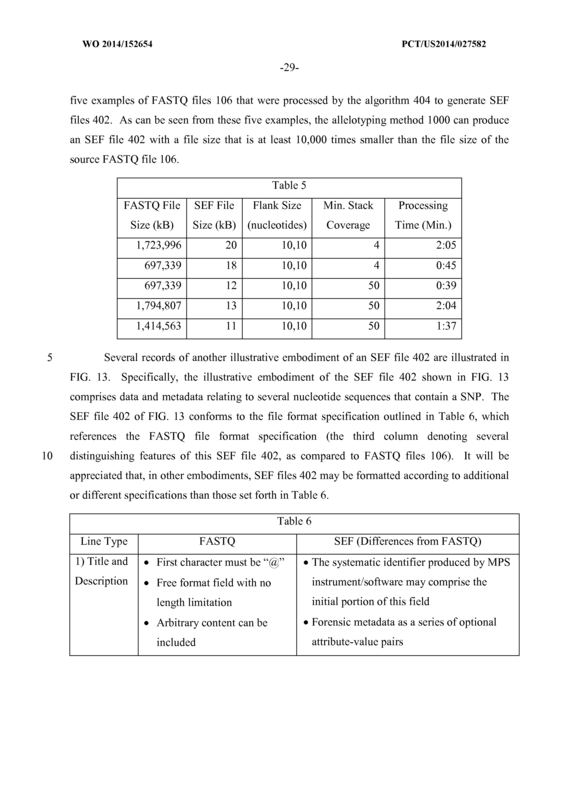 The method of claim 1, wherein the first text-based computer file is formatted as a FASTQ file. 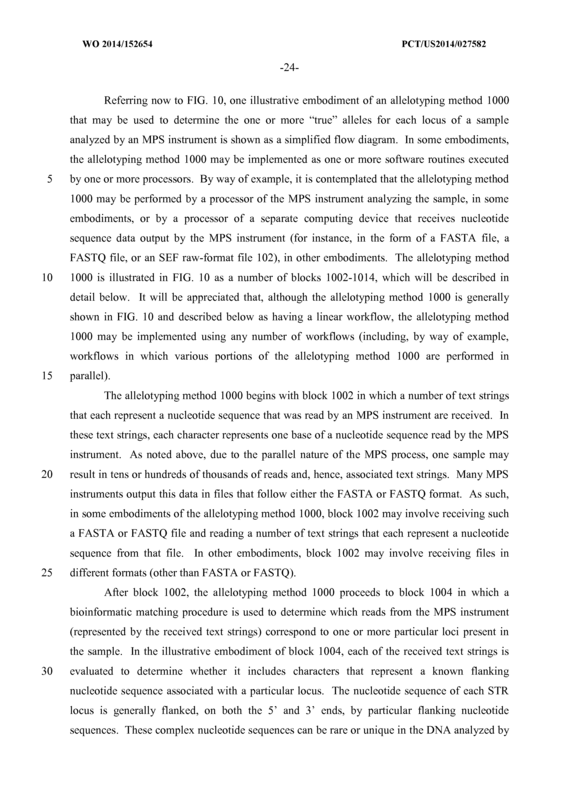 The method of any preceding claim, wherein determining whether a portion of the nucleotide sequence data of a record represents an STR associated with a locus comprises determining whether a portion of the nucleotide sequence data of the record represents a primer sequence used to amplify the locus. 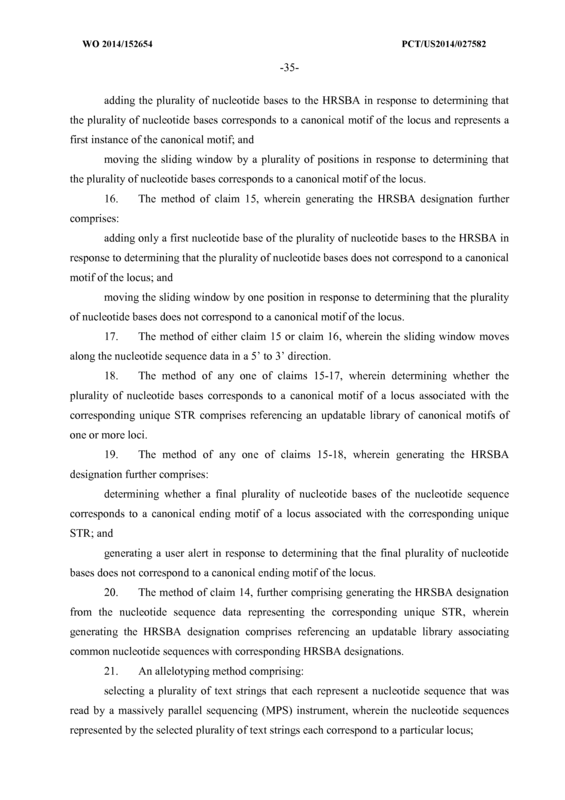 The method of claim 3, wherein determining whether a portion of the nucleotide sequence data of the record represents a primer sequence used to amplify the locus comprises referencing an updateable library of primer sequences. 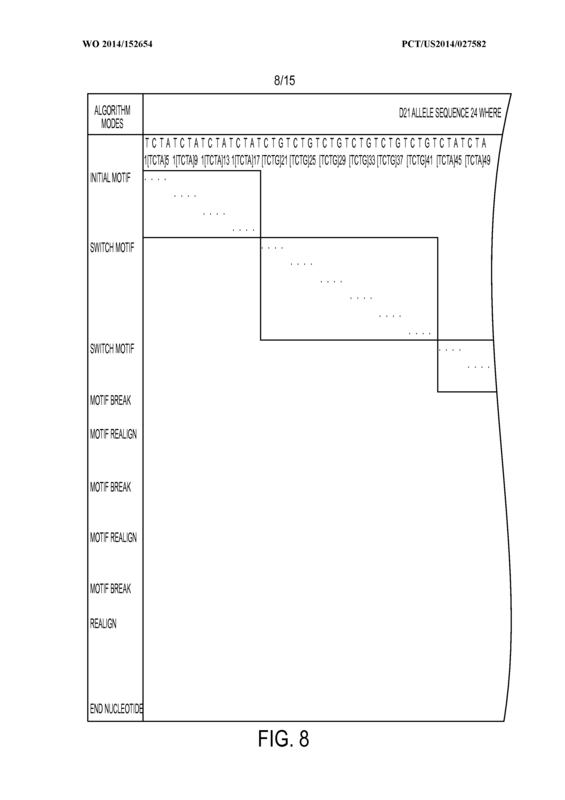 The method of any preceding claim, wherein placing each portion of the nucleotide sequence data determined to represent an STR associated with a locus into one of a number of locus-specific lists comprises removing a portion of the nucleotide sequence data representing a flanking sequence. 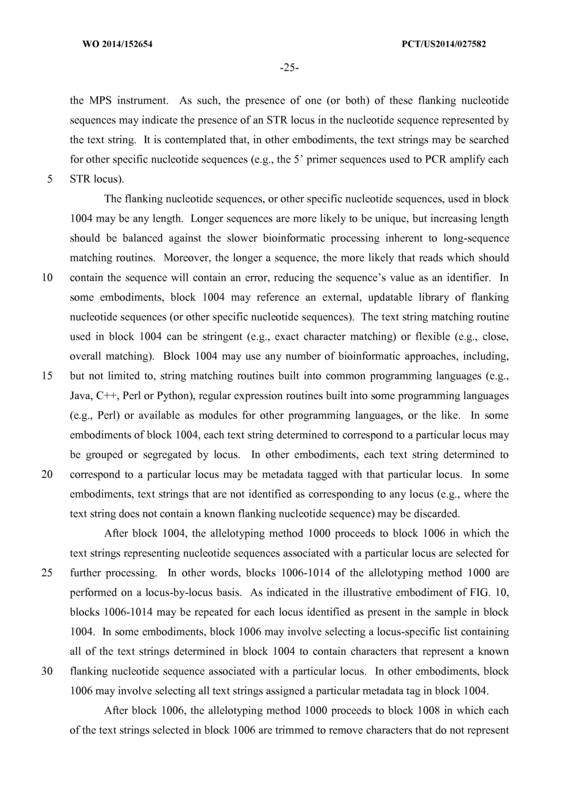 The method of claim 5, wherein removing a portion of the nucleotide sequence data representing a flanking sequence comprises referencing an updateable library of flanking sequences. 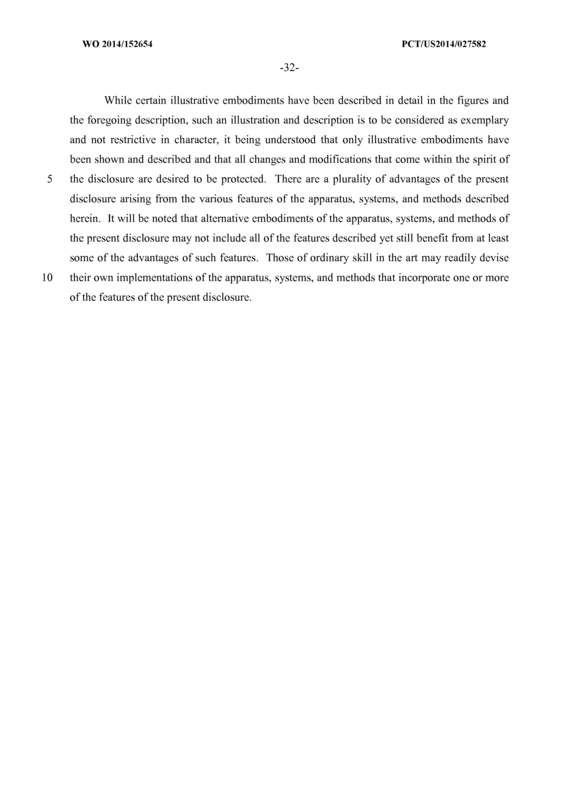 The method of any preceding claim, wherein the abundance threshold is user- defined. 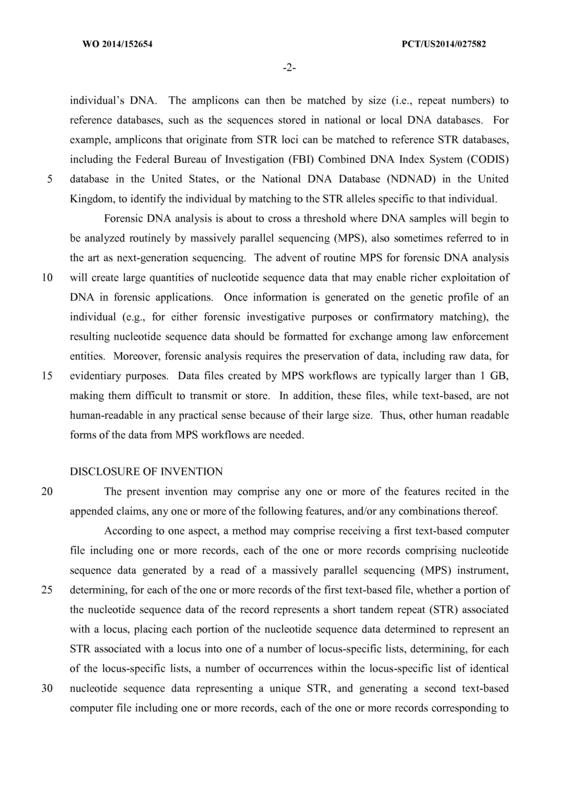 The method of any preceding claim, wherein generating the second text-based computer file comprises, for each of the one or more records, writing nucleotide sequence data representing the corresponding unique STR to a second text line of the record. 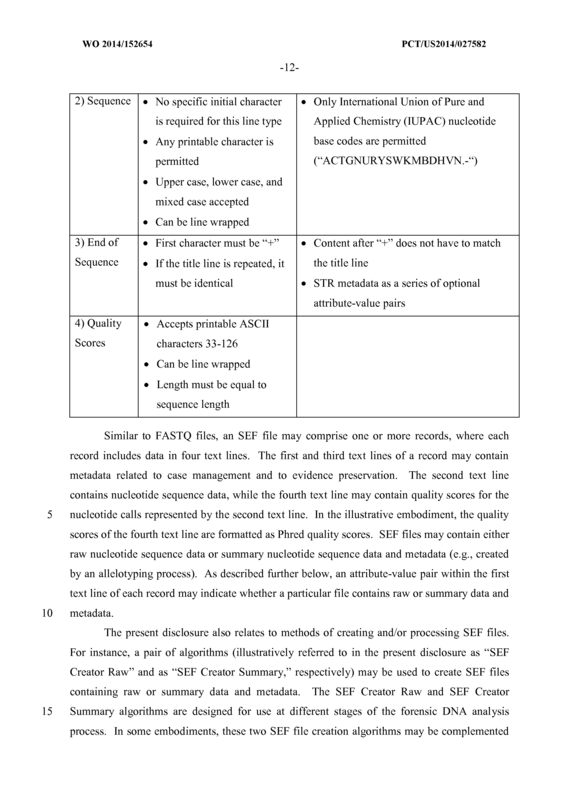 The method of claim 8, wherein generating the second text-based computer file further comprises, for each of the one or more records, writing average quality scores for the nucleotide sequence data representing the corresponding unique STR to a fourth text line of the record. 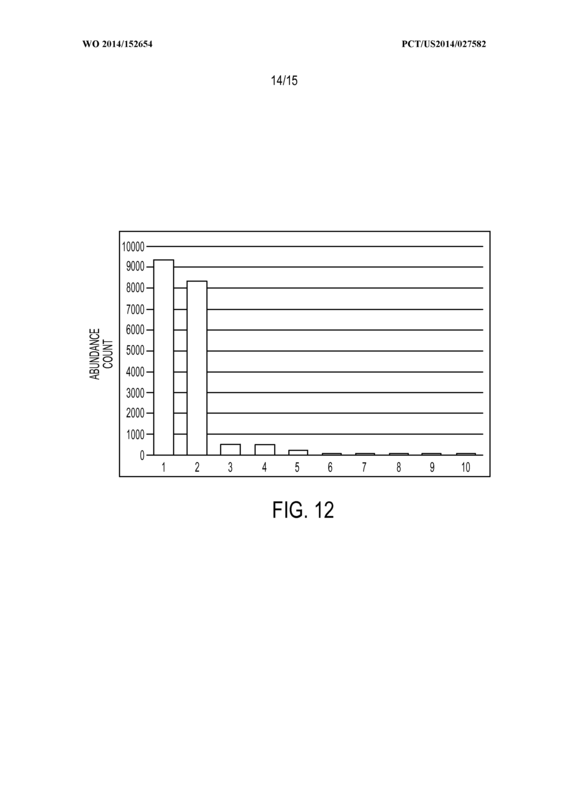 The method of claim 9, wherein the average quality scores are formatted as average Phred quality scores. 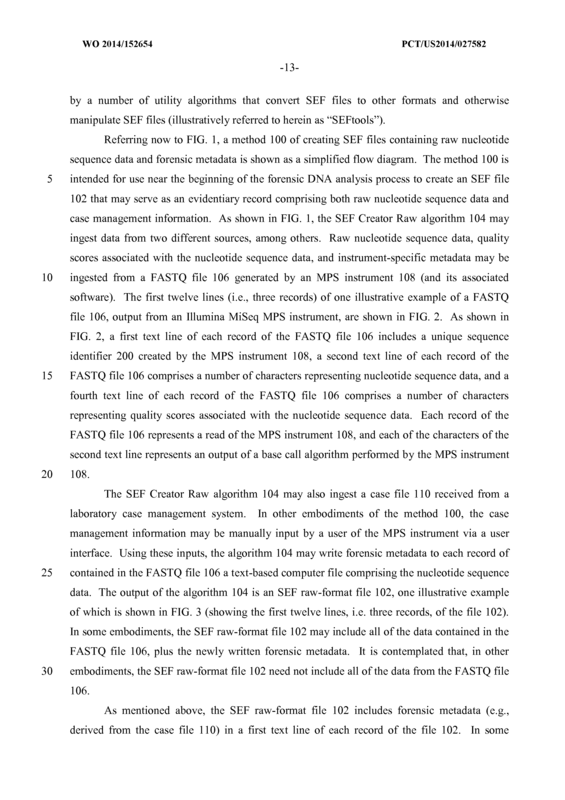 The method of any one of claims 8-10, wherein generating the second text-based computer file further comprises, for each of the one or more records, writing forensic metadata associated with the nucleotide sequence data representing the corresponding unique STR to a first text line of the record. 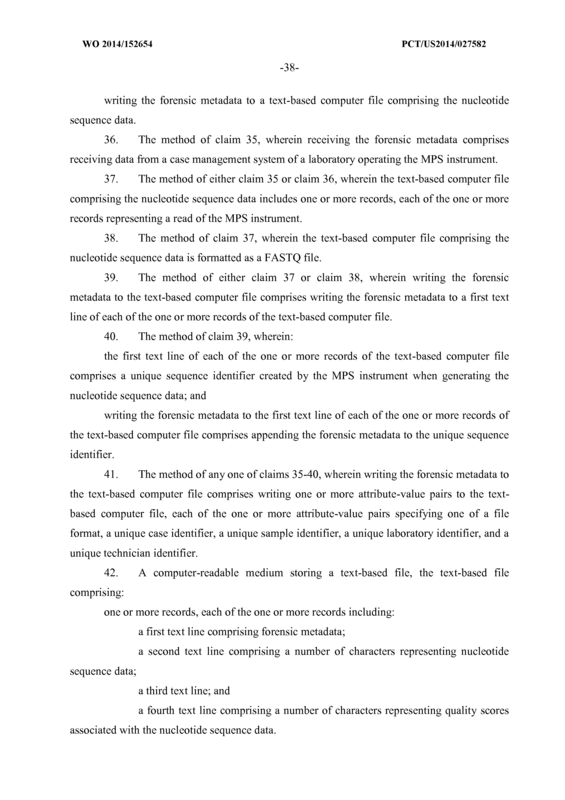 The method of claim 11, wherein the forensic metadata is copied from the first text-based computer file. 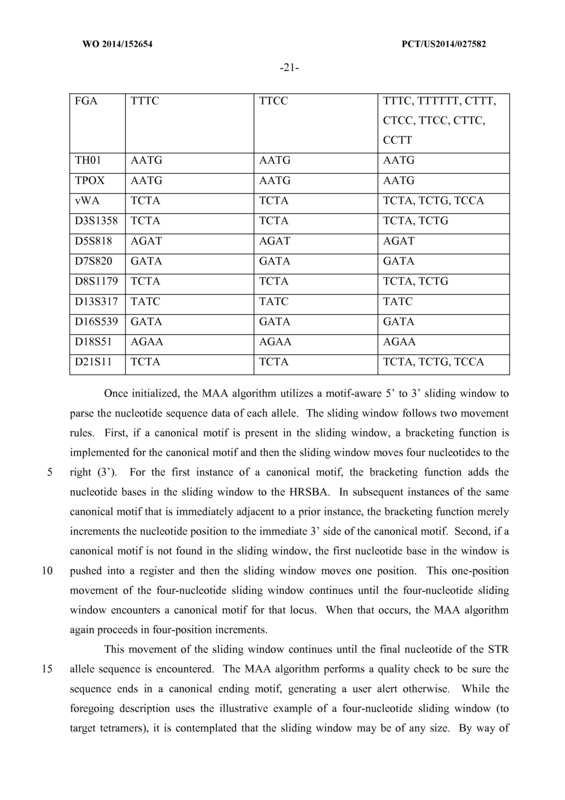 The method of any one of claims 8-12, wherein generating the second text-based computer file further comprises, for each of the one or more records, writing an attribute -value pair specifying the number of occurrences of identical nucleotide sequence data representing the corresponding unique STR to a third text line of the record. 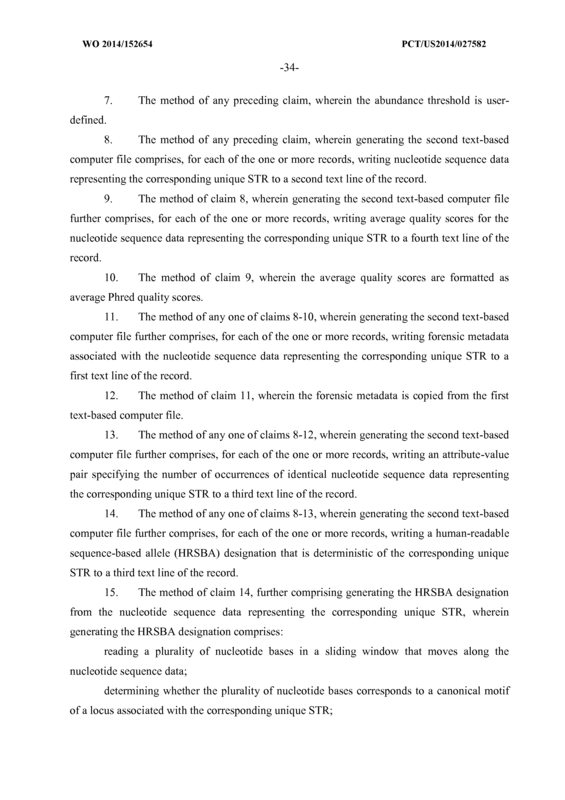 The method of any one of claims 8-13, wherein generating the second text-based computer file further comprises, for each of the one or more records, writing a human-readable sequence-based allele (HRSBA) designation that is deterministic of the corresponding unique STR to a third text line of the record. moving the sliding window by a plurality of positions in response to determining that the plurality of nucleotide bases corresponds to a canonical motif of the locus. moving the sliding window by one position in response to determining that the plurality of nucleotide bases does not correspond to a canonical motif of the locus. The method of either claim 15 or claim 16, wherein the sliding window moves along the nucleotide sequence data in a 5 ' to 3 ' direction. 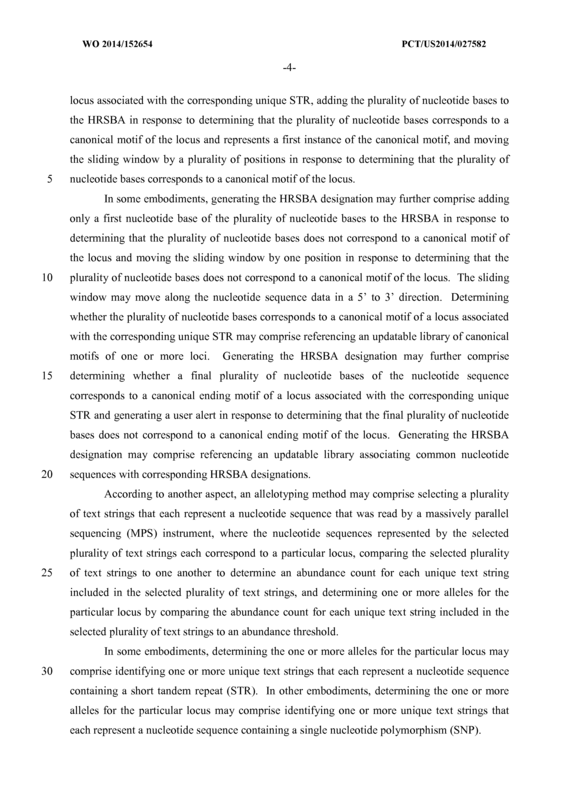 The method of any one of claims 15-17, wherein determining whether the plurality of nucleotide bases corresponds to a canonical motif of a locus associated with the corresponding unique STR comprises referencing an updatable library of canonical motifs of one or more loci. 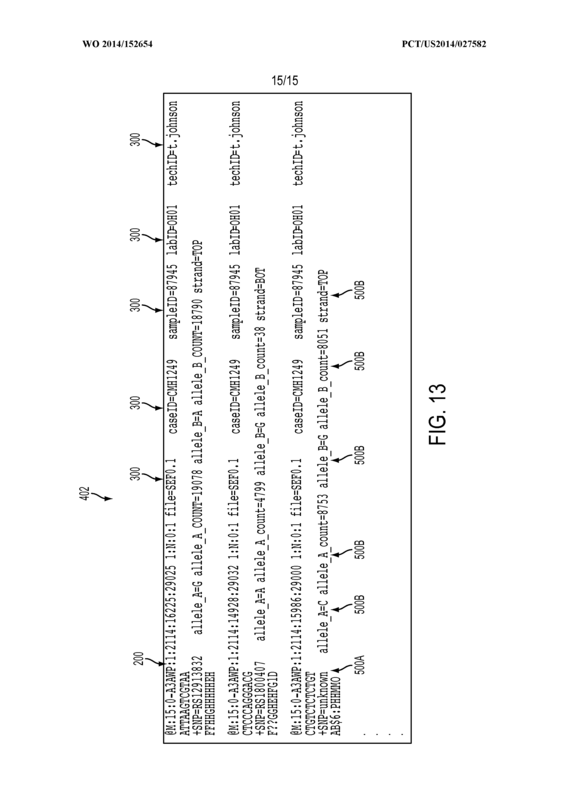 generating a user alert in response to determining that the final plurality of nucleotide bases does not correspond to a canonical ending motif of the locus. 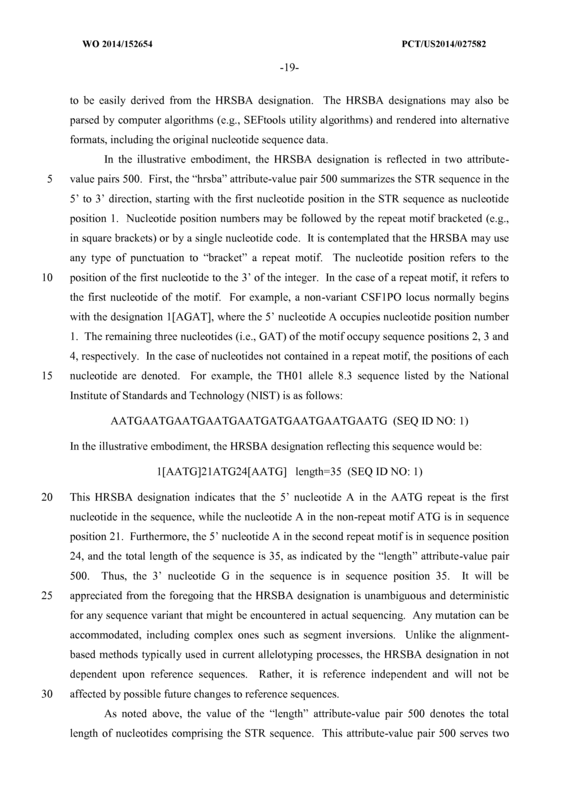 The method of claim 14, further comprising generating the HRSBA designation from the nucleotide sequence data representing the corresponding unique STR, wherein generating the HRSBA designation comprises referencing an updatable library associating common nucleotide sequences with corresponding HRSBA designations. 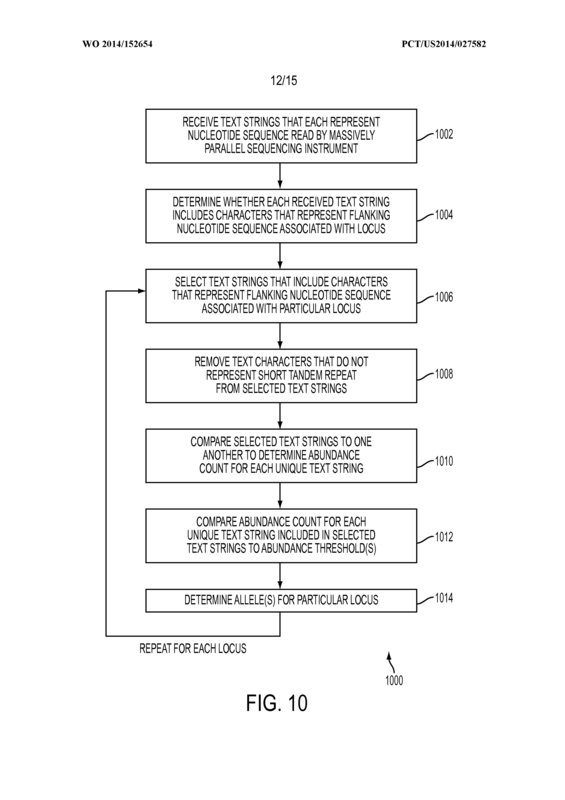 determining one or more alleles for the particular locus by comparing the abundance count for each unique text string included in the selected plurality of text strings to an abundance threshold. 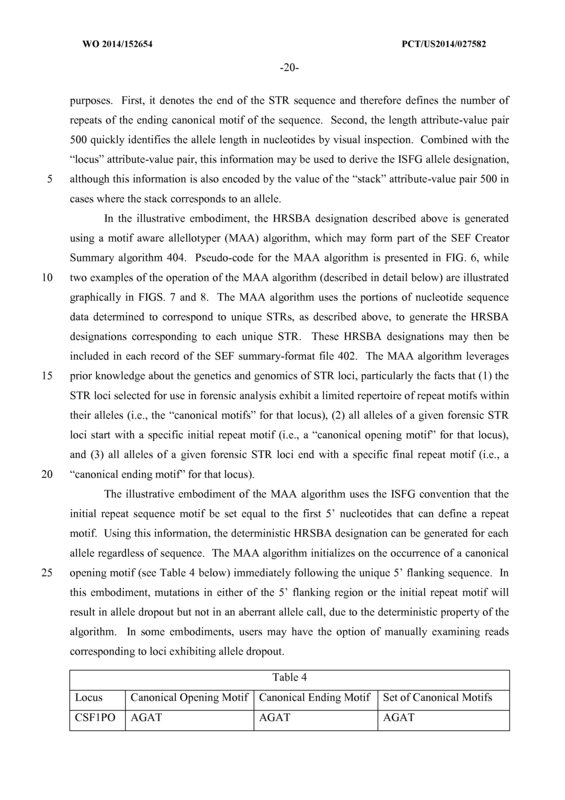 The allelotyping method of claim 21, wherein determining the one or more alleles for the particular locus comprises identifying one or more unique text strings that each represent a nucleotide sequence containing a short tandem repeat (STR). 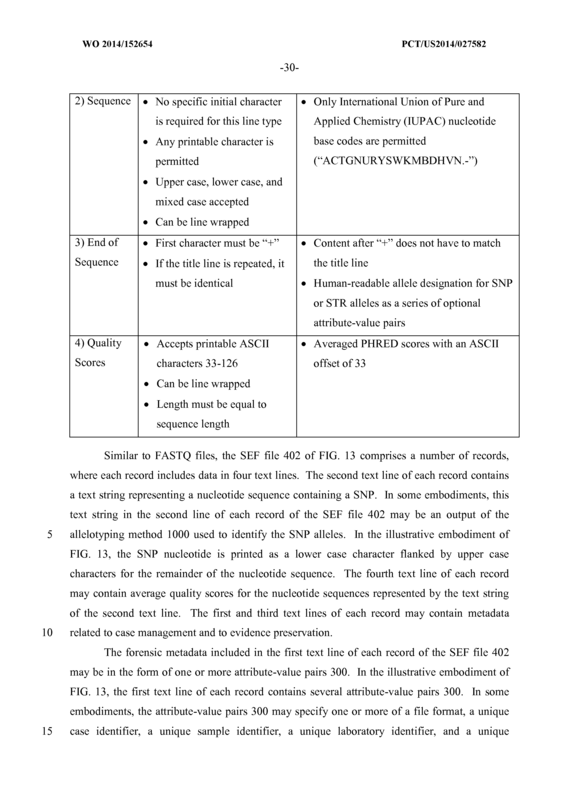 The allelotyping method of claim 21, wherein determining the one or more alleles for the particular locus comprises identifying one or more unique text strings that each represent a nucleotide sequence containing a single nucleotide polymorphism (SNP). 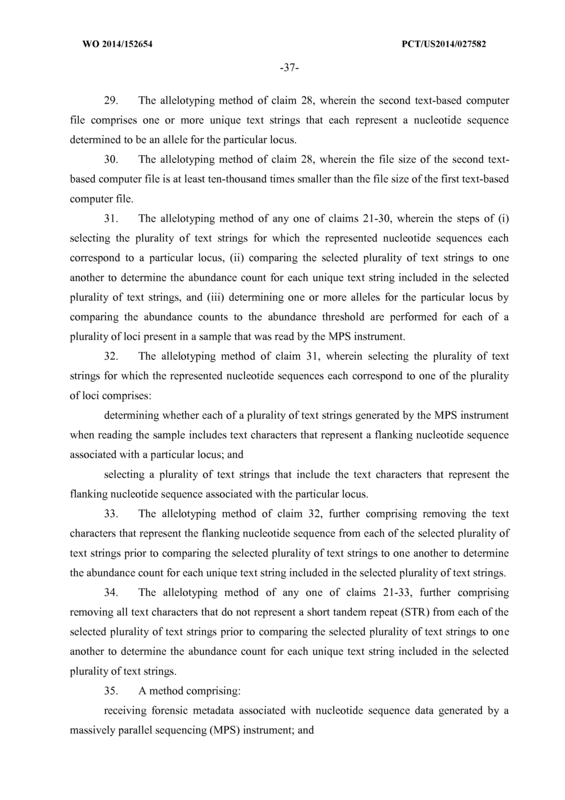 The allelotyping method of any one of claims 21-23, wherein comparing the abundance count for each unique text string included in the selected plurality of text strings to the abundance threshold comprises identifying the unique text string having a highest abundance count from among the selected plurality of text strings. 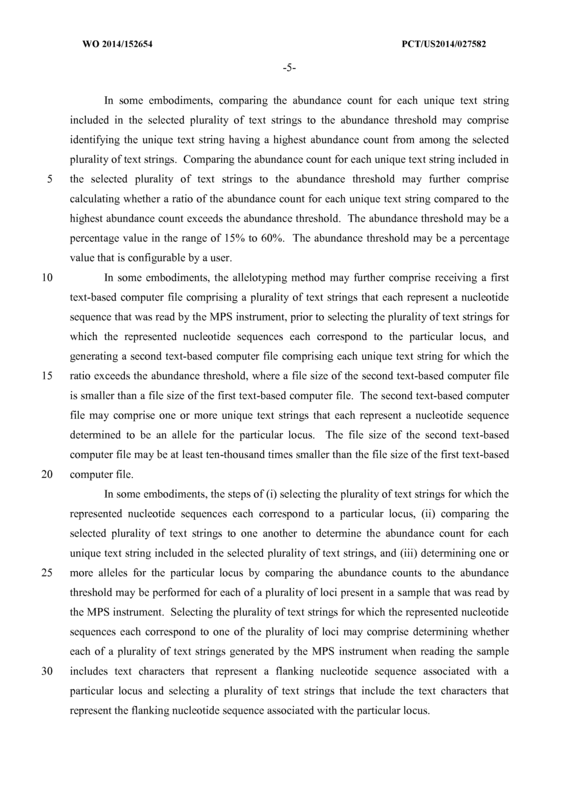 The allelotyping method of claim 24, wherein comparing the abundance count for each unique text string included in the selected plurality of text strings to the abundance threshold further comprises calculating whether a ratio of the abundance count for each unique text string compared to the highest abundance count exceeds the abundance threshold. 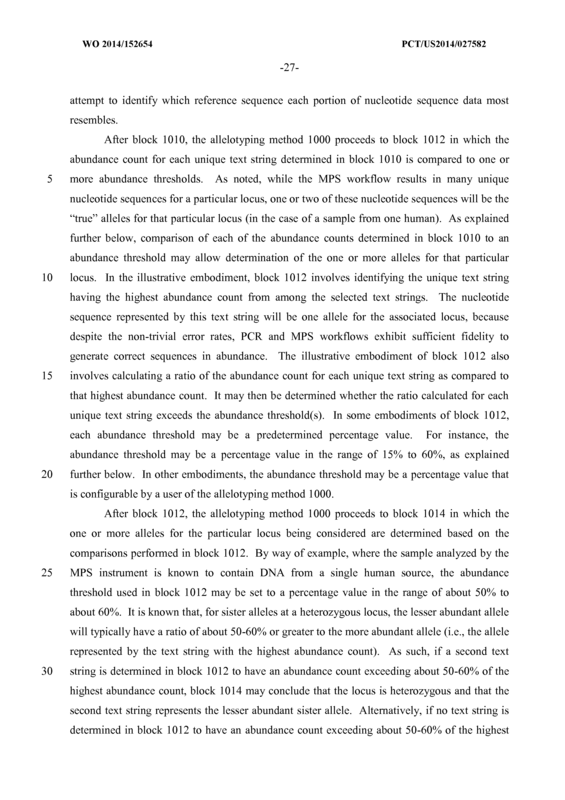 The allelotyping method of claim 25, wherein the abundance threshold is a percentage value in the range of 15% to 60%. 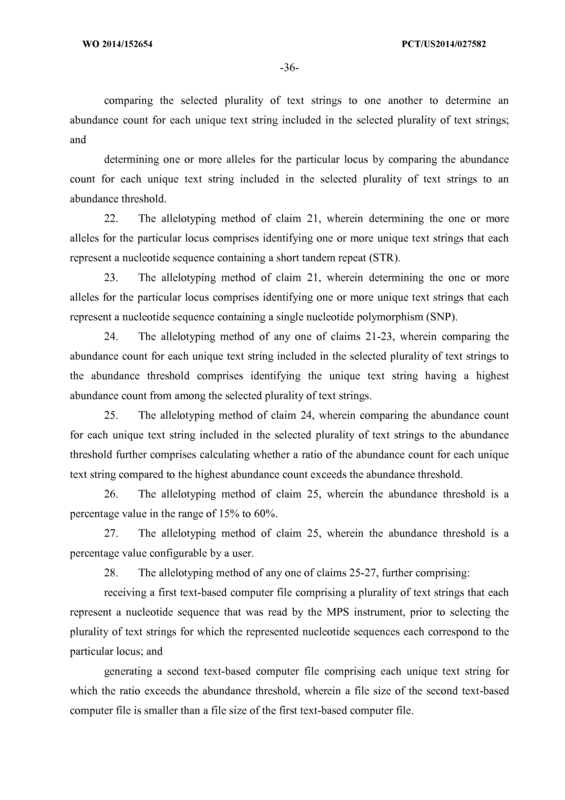 The allelotyping method of claim 25, wherein the abundance threshold is a percentage value configurable by a user. 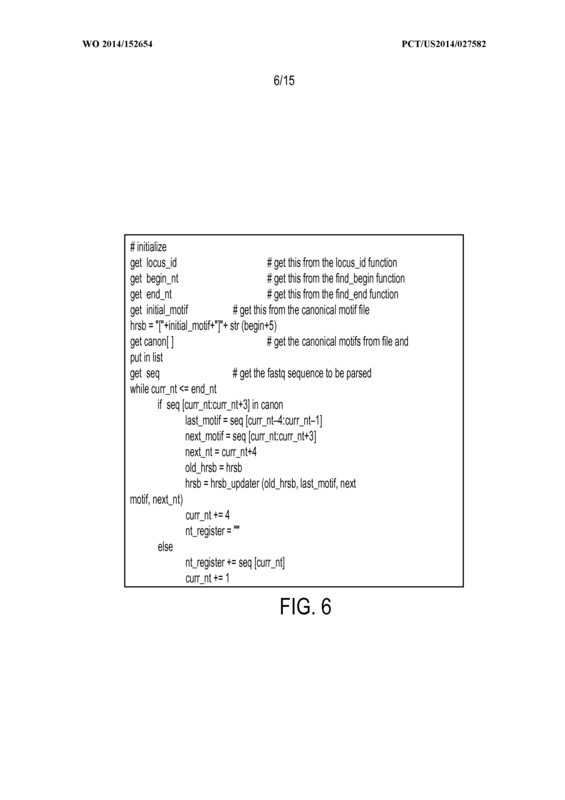 generating a second text-based computer file comprising each unique text string for which the ratio exceeds the abundance threshold, wherein a file size of the second text -based computer file is smaller than a file size of the first text-based computer file. 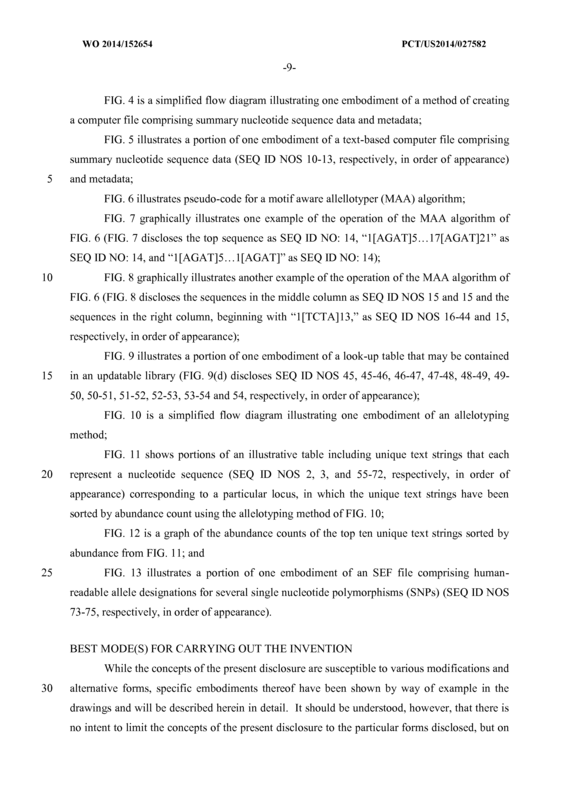 The allelotyping method of claim 28, wherein the second text-based computer file comprises one or more unique text strings that each represent a nucleotide sequence determined to be an allele for the particular locus. 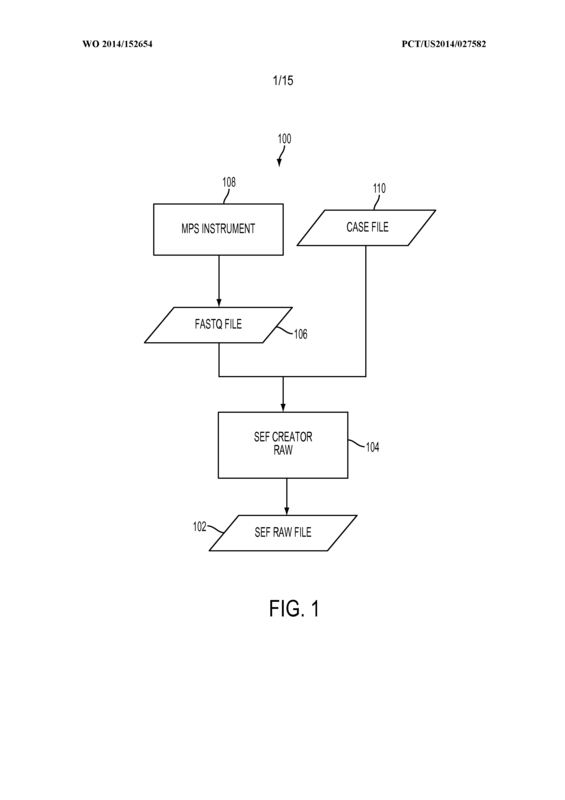 The allelotyping method of claim 28, wherein the file size of the second text- based computer file is at least ten-thousand times smaller than the file size of the first text-based computer file. 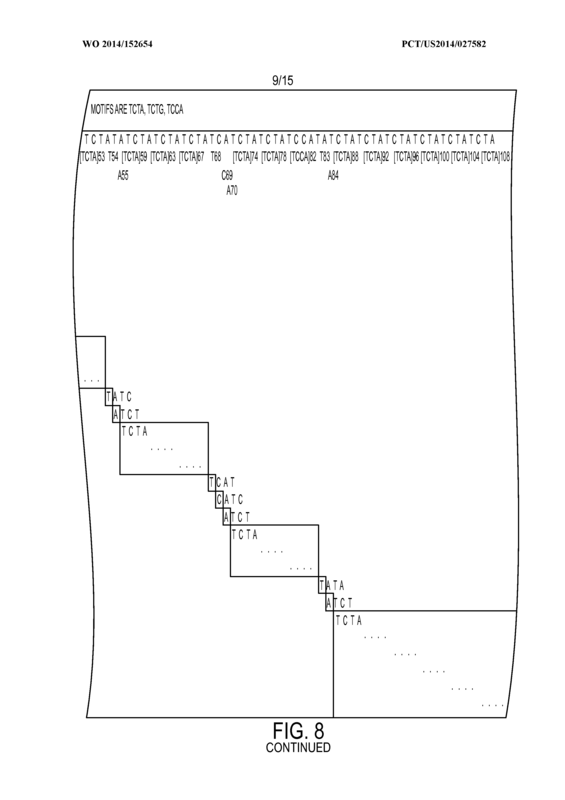 The allelotyping method of any one of claims 21-30, wherein the steps of (i) selecting the plurality of text strings for which the represented nucleotide sequences each correspond to a particular locus, (ii) comparing the selected plurality of text strings to one another to determine the abundance count for each unique text string included in the selected plurality of text strings, and (iii) determining one or more alleles for the particular locus by comparing the abundance counts to the abundance threshold are performed for each of a plurality of loci present in a sample that was read by the MPS instrument. 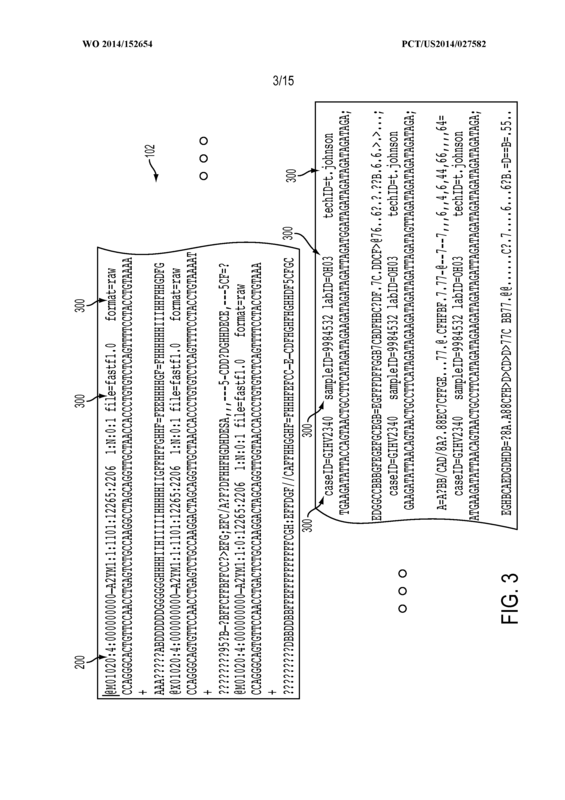 selecting a plurality of text strings that include the text characters that represent the flanking nucleotide sequence associated with the particular locus. 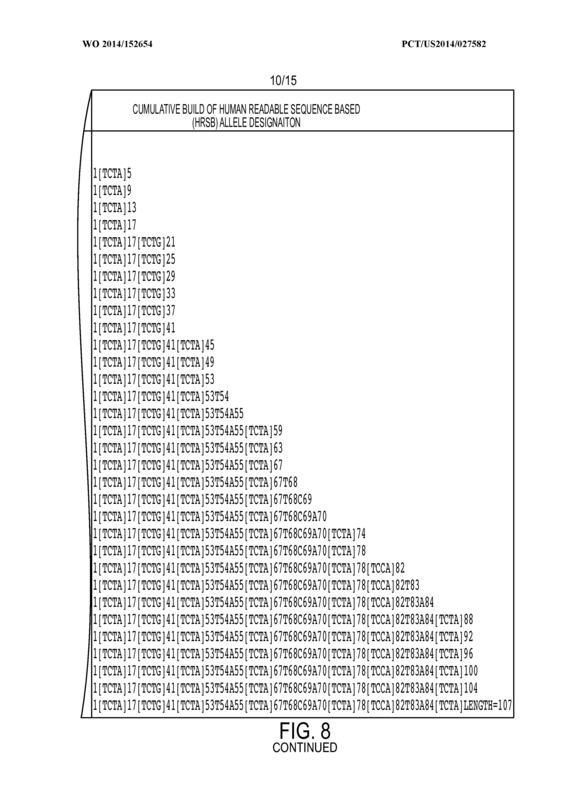 The allelotyping method of claim 32, further comprising removing the text characters that represent the flanking nucleotide sequence from each of the selected plurality of text strings prior to comparing the selected plurality of text strings to one another to determine the abundance count for each unique text string included in the selected plurality of text strings. 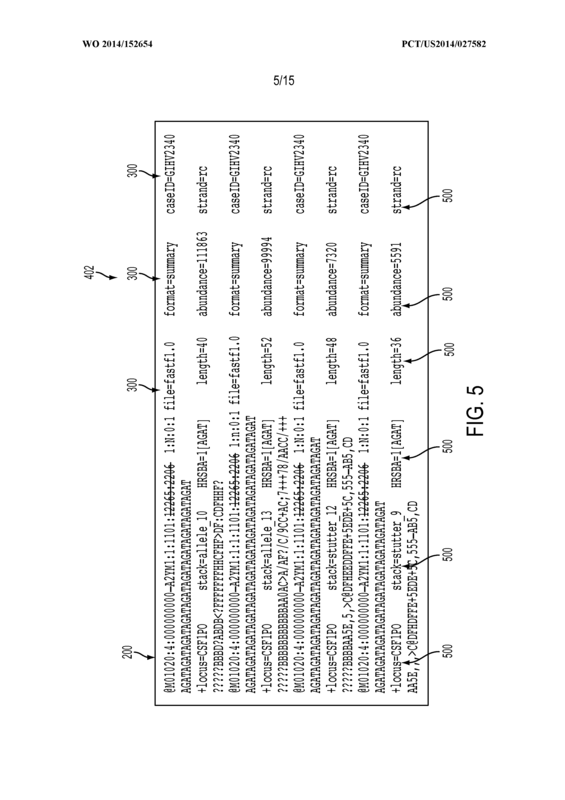 The allelotyping method of any one of claims 21-33, further comprising removing all text characters that do not represent a short tandem repeat (STR) from each of the selected plurality of text strings prior to comparing the selected plurality of text strings to one another to determine the abundance count for each unique text string included in the selected plurality of text strings. 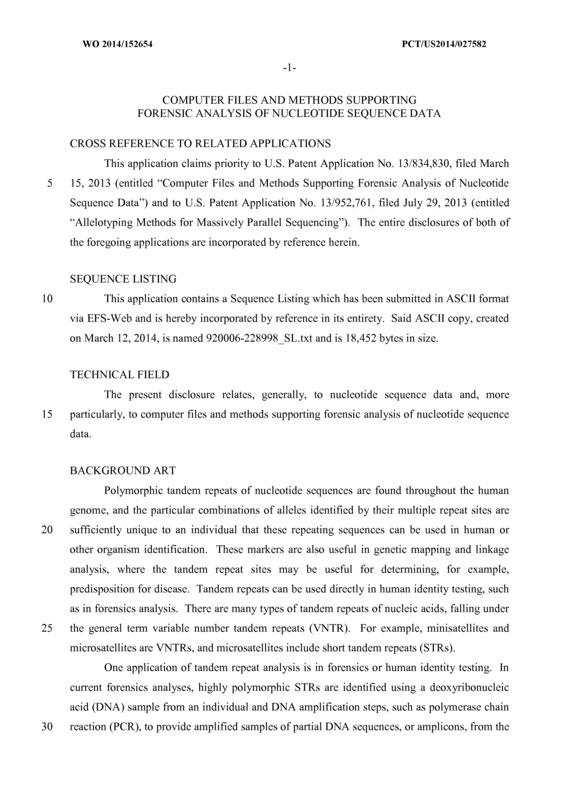 receiving forensic metadata associated with nucleotide sequence data generated by a massively parallel sequencing (MPS) instrument; and writing the forensic metadata to a text-based computer file comprising the nucleotide sequence data. 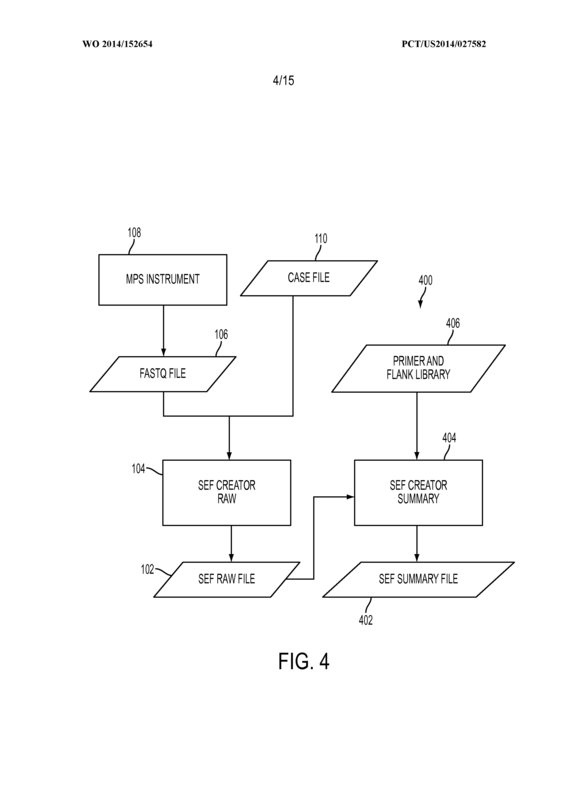 The method of claim 35, wherein receiving the forensic metadata comprises receiving data from a case management system of a laboratory operating the MPS instrument. 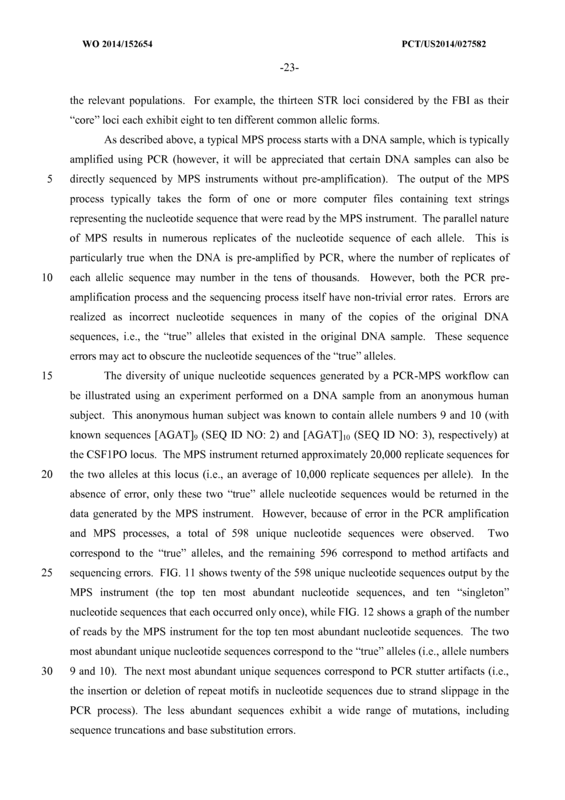 The method of either claim 35 or claim 36, wherein the text-based computer file comprising the nucleotide sequence data includes one or more records, each of the one or more records representing a read of the MPS instrument. 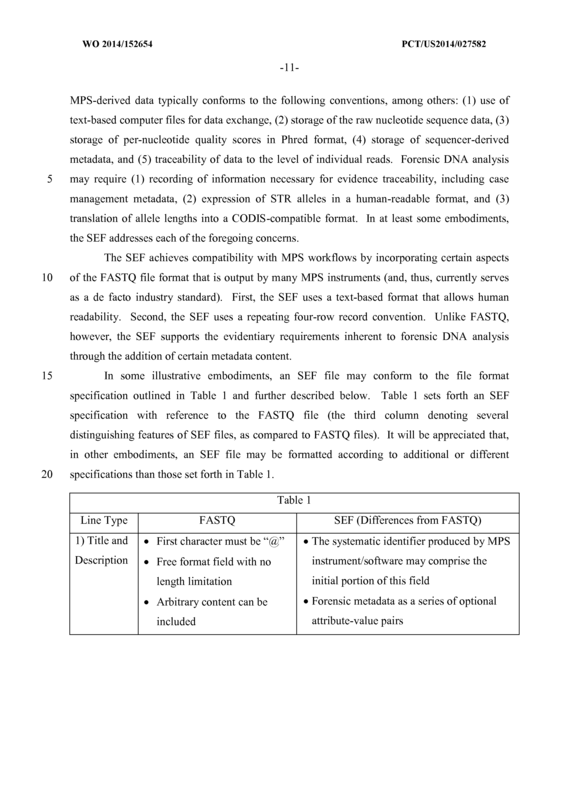 The method of claim 37, wherein the text-based computer file comprising the nucleotide sequence data is formatted as a FASTQ file. 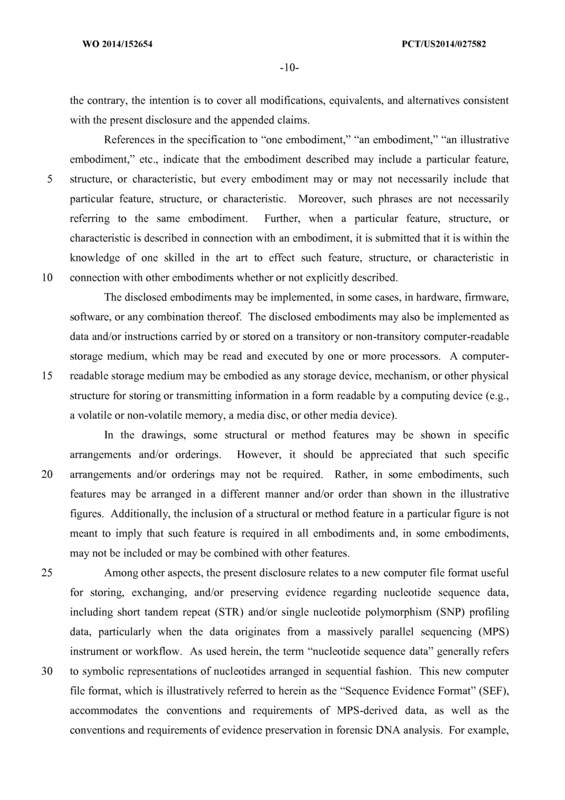 The method of either claim 37 or claim 38, wherein writing the forensic metadata to the text-based computer file comprises writing the forensic metadata to a first text line of each of the one or more records of the text-based computer file. 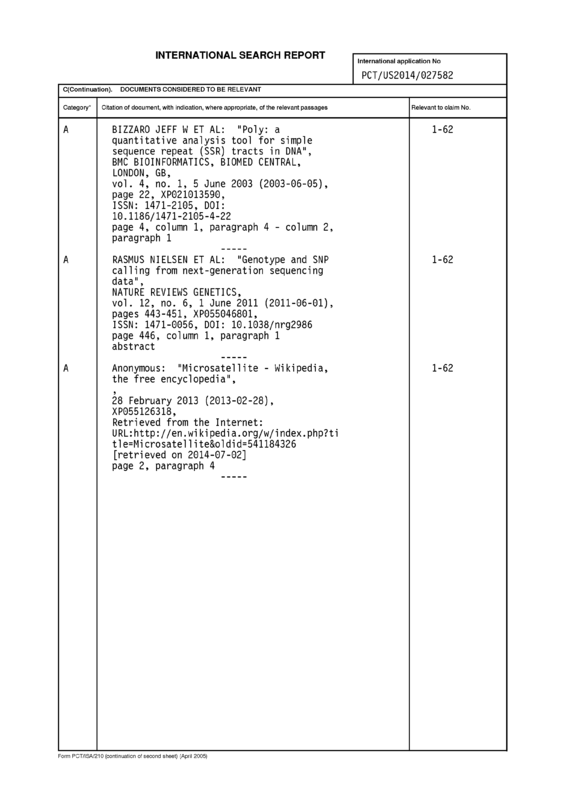 writing the forensic metadata to the first text line of each of the one or more records of the text-based computer file comprises appending the forensic metadata to the unique sequence identifier. 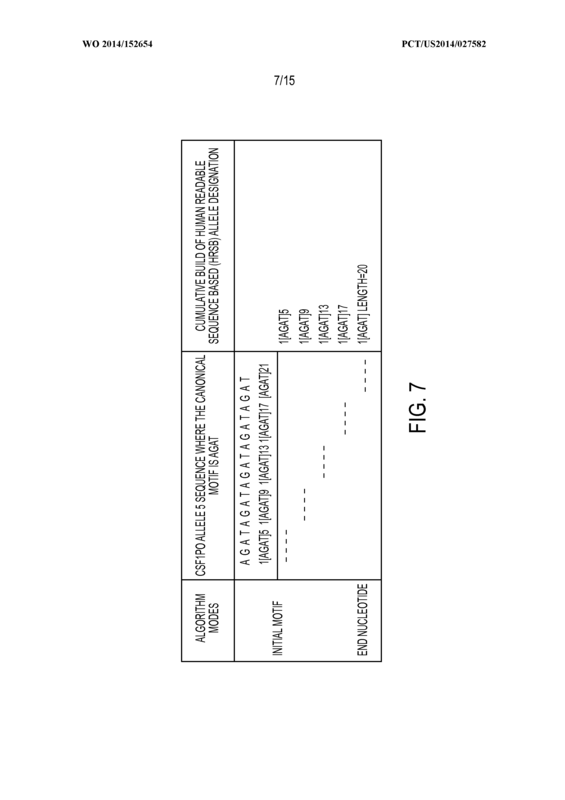 The method of any one of claims 35-40, wherein writing the forensic metadata to the text-based computer file comprises writing one or more attribute -value pairs to the text- based computer file, each of the one or more attribute -value pairs specifying one of a file format, a unique case identifier, a unique sample identifier, a unique laboratory identifier, and a unique technician identifier. 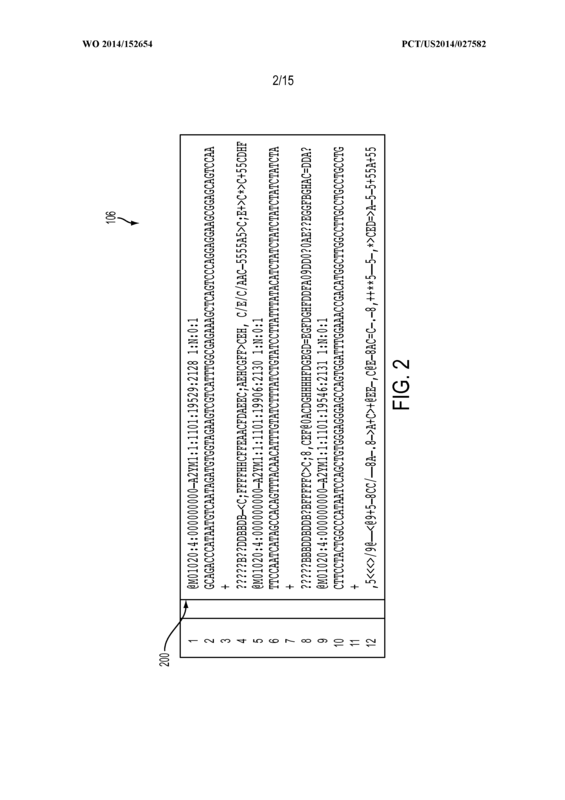 a fourth text line comprising a number of characters representing quality scores associated with the nucleotide sequence data. 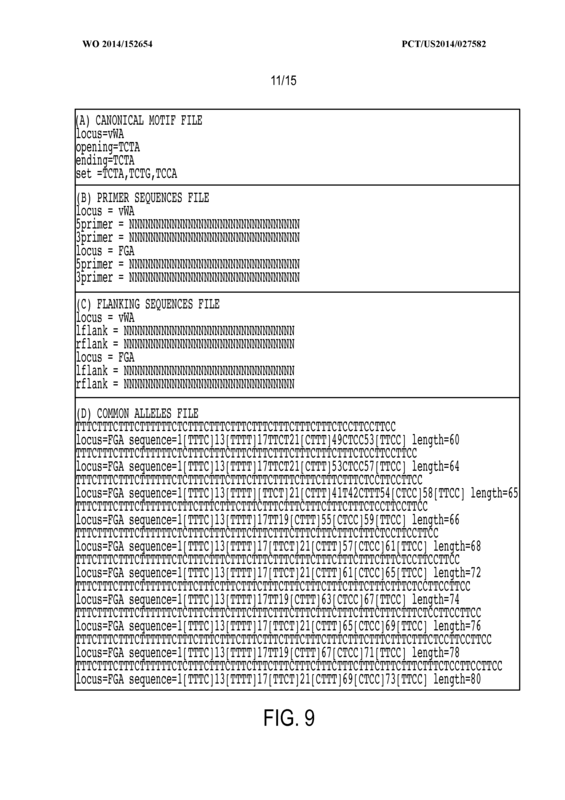 The computer-readable medium of claim 42, wherein, for each of the one or more records of the text-based file, each of the characters of the second text line represents an output of a base call algorithm performed by a massively parallel sequencing (MPS) instrument. 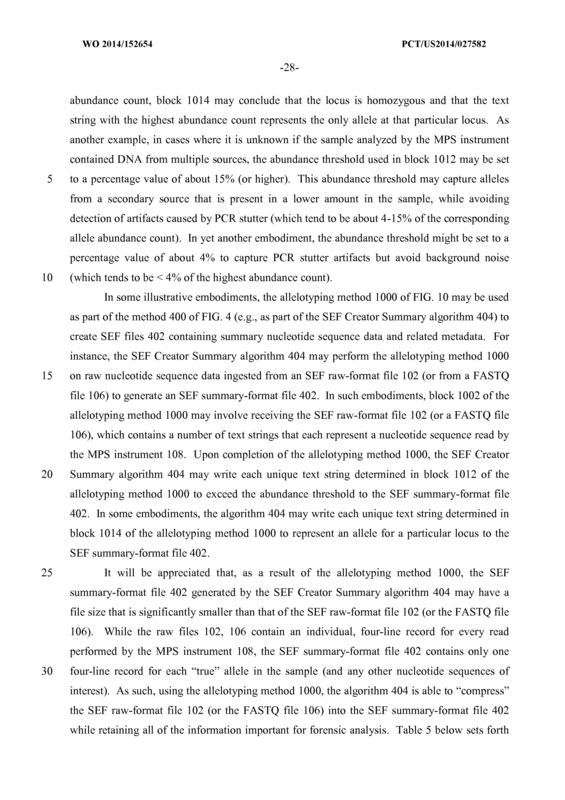 The computer-readable medium of claim 43, wherein, for each of the one or more records of the text-based file, the first text line further comprises a unique sequence identifier created by the MPS instrument when generating the nucleotide sequence data. 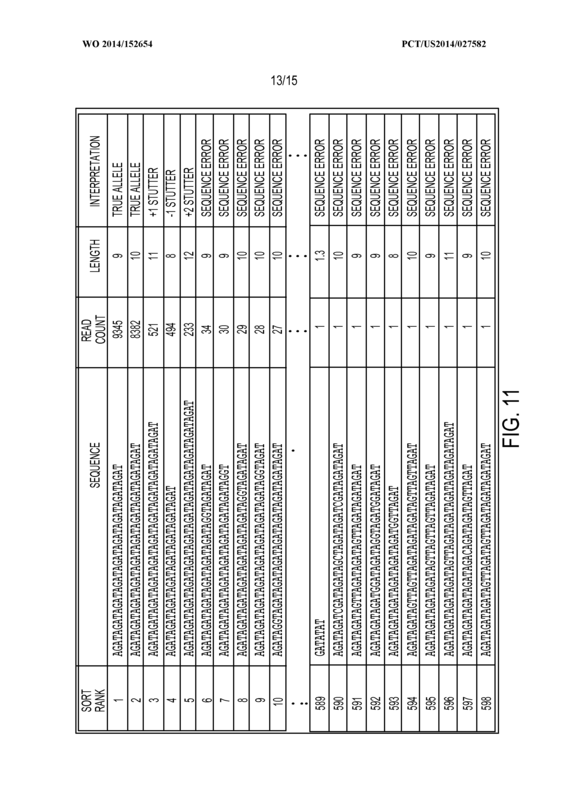 The computer-readable medium of any one of claims 42-44, wherein, for each of the one or more records of the text-based file, the forensic metadata of the first text line comprises one or more attribute -value pairs, each of the one or more attribute -value pairs specifying one of a file format, a unique case identifier, a unique sample identifier, a unique laboratory identifier, and a unique technician identifier. 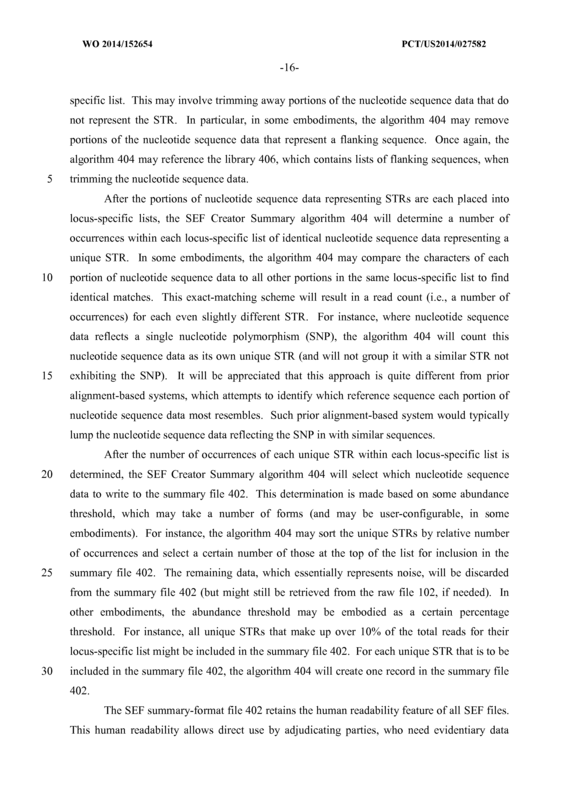 The computer-readable medium of any one of claims 42-45, wherein, for each of the one or more records of the text-based file, the nucleotide sequence data represents a short tandem repeat (STR) for which a read count from a sample exceeded an abundance threshold. 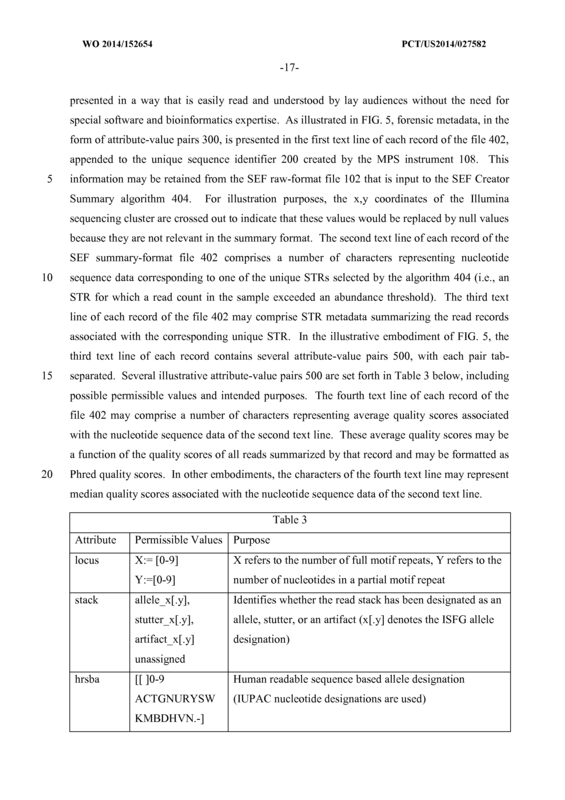 The computer-readable medium of claim 46, wherein, for each of the one or more records of the text-based file, the third text line comprises an attribute -value pair specifying the read count of the STR. 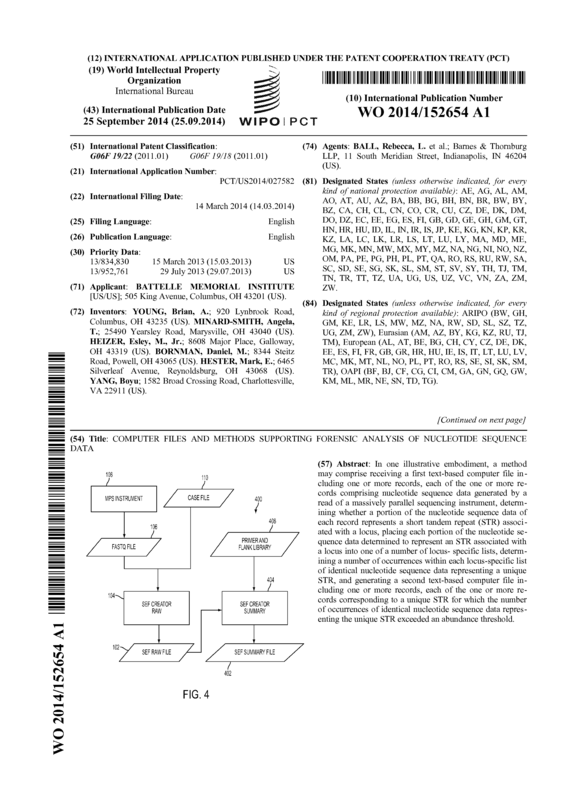 The computer-readable medium of either claim 46 or claim 47, wherein, for each of the one or more records of the text-based file, each of the characters of the fourth text line represents an average quality score associated with a corresponding character of the second text line, the average quality score being a function of quality scores associated with all reads of the STR. 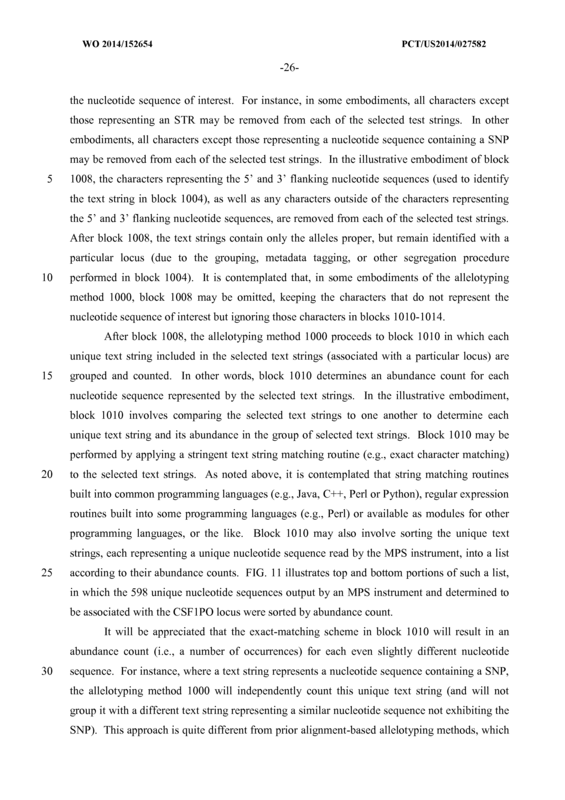 The computer-readable medium of claim 48, wherein, for each of the one or more records of the text-based file, each of the characters of the fourth text line is formatted as an average Phred quality score. 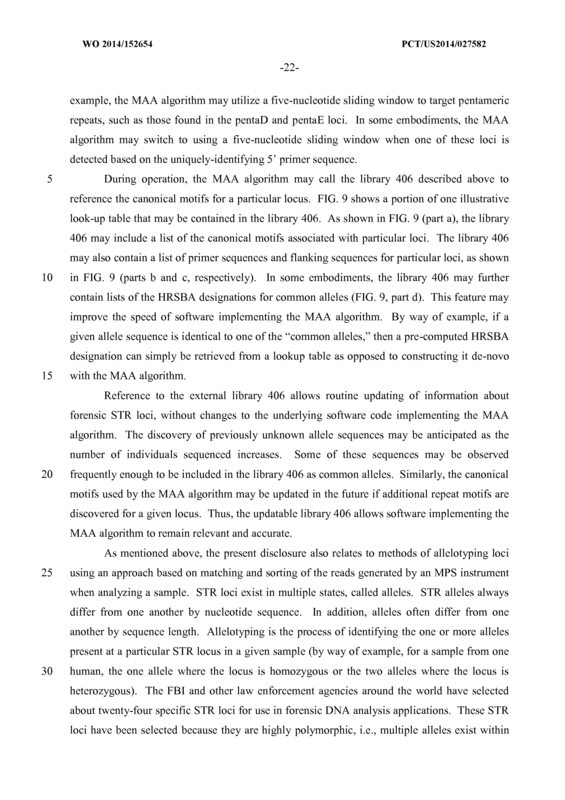 The computer-readable medium of any one of claims 46-49, wherein, for each of the one or more records of the text-based file, the third text line comprises a human-readable sequence-based allele (HRSBA) designation that is deterministic of the STR. 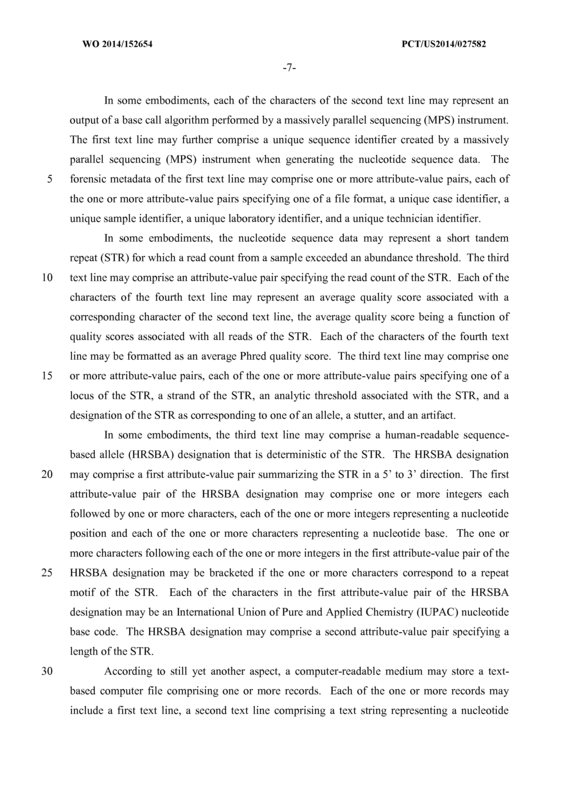 The computer-readable medium of claim 50, wherein, for each of the one or more records of the text-based file, the HRSBA designation comprises a first attribute -value pair summarizing the STR in a 5 ' to 3 ' direction. 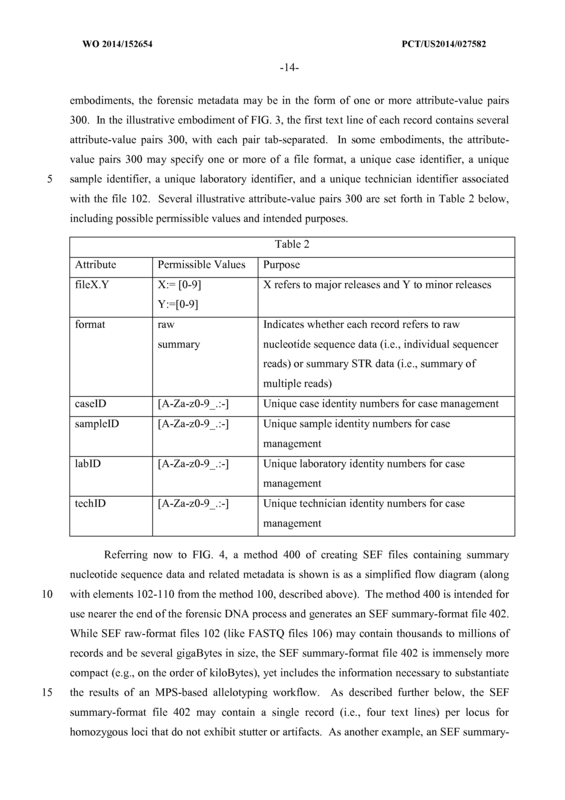 The computer-readable medium of claim 51, wherein, for each of the one or more records of the text-based file, the first attribute -value pair of the HRSBA designation comprises one or more integers each followed by one or more characters, each of the one or more integers representing a nucleotide position and each of the one or more characters representing a nucleotide base. 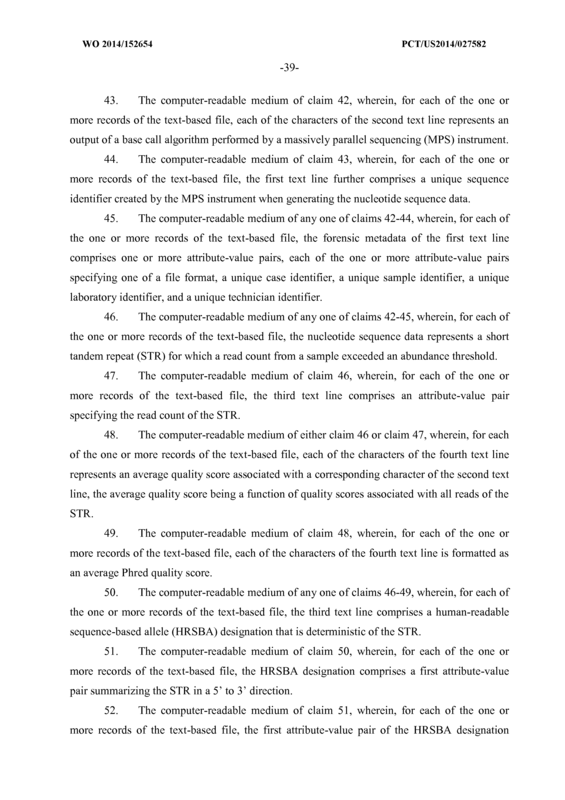 The computer-readable medium of claim 52, wherein, for each of the one or more records of the text-based file, the one or more characters following each of the one or more integers in the first attribute-value pair of the HRSBA designation are bracketed if the one or more characters correspond to a repeat motif of the STR. 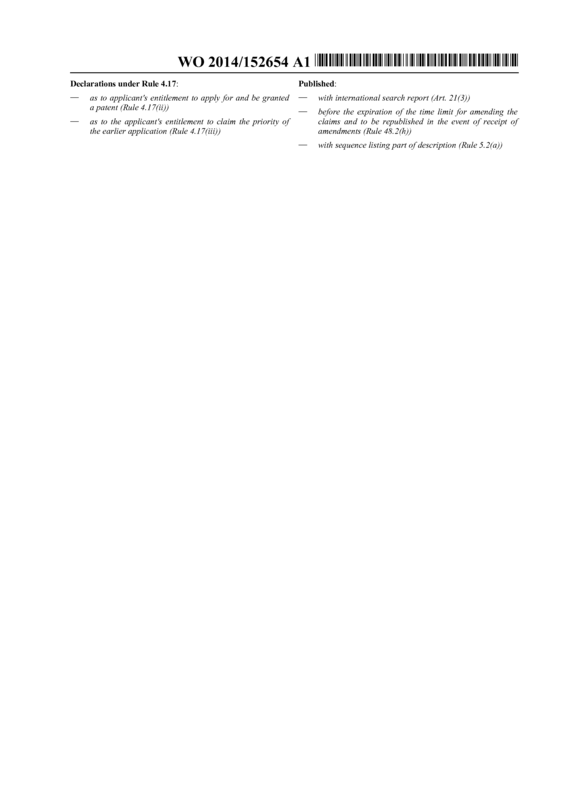 The computer-readable medium of either claim 52 or claim 53, wherein, for each of the one or more records of the text-based file, each of the characters in the first attribute- value pair of the HRSBA designation is an International Union of Pure and Applied Chemistry (IUPAC) nucleotide base code. 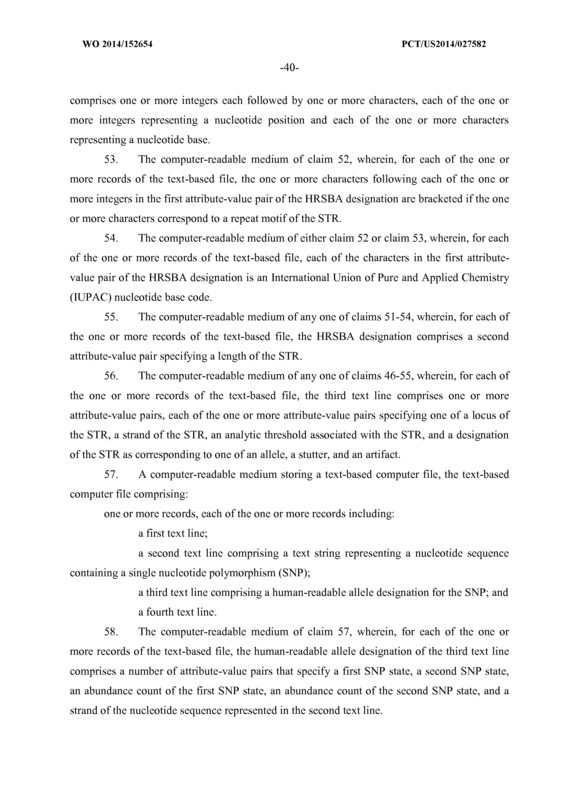 The computer-readable medium of any one of claims 51-54, wherein, for each of the one or more records of the text-based file, the HRSBA designation comprises a second attribute-value pair specifying a length of the STR. 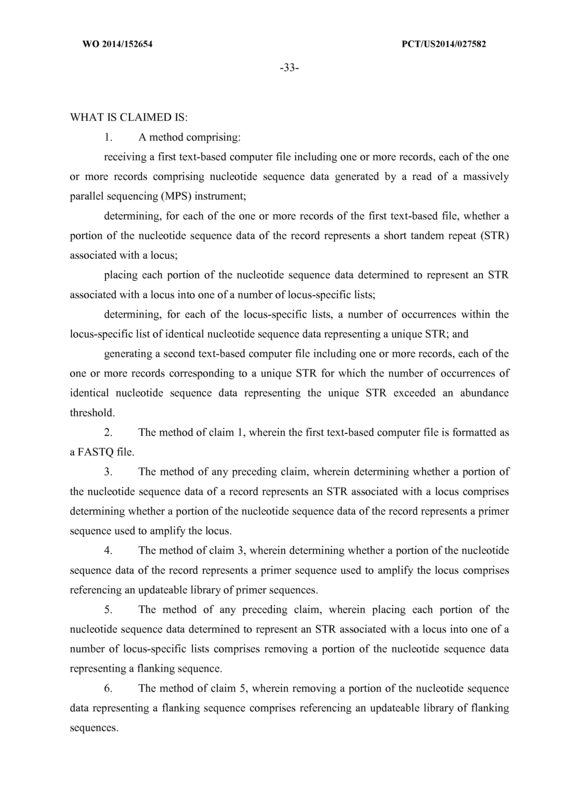 The computer-readable medium of any one of claims 46-55, wherein, for each of the one or more records of the text-based file, the third text line comprises one or more attribute-value pairs, each of the one or more attribute-value pairs specifying one of a locus of the STR, a strand of the STR, an analytic threshold associated with the STR, and a designation of the STR as corresponding to one of an allele, a stutter, and an artifact. a third text line comprising a human-readable allele designation for the SNP; and a fourth text line. 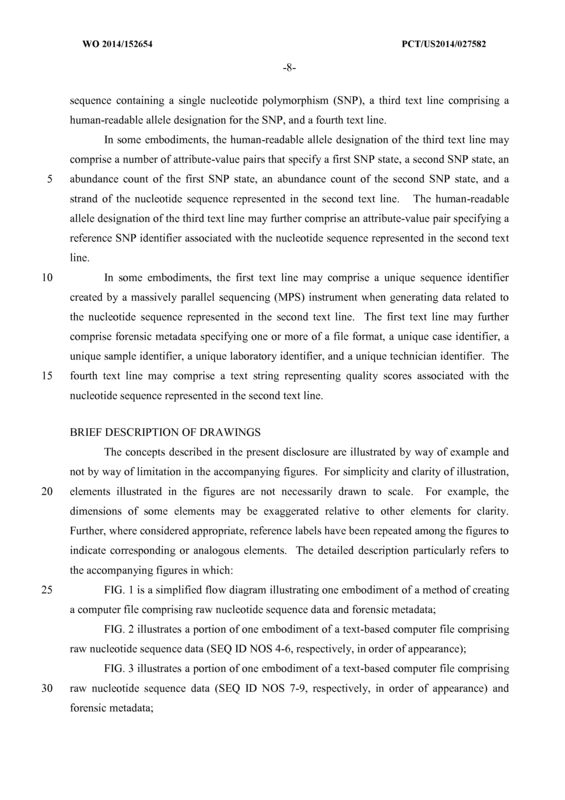 The computer-readable medium of claim 57, wherein, for each of the one or more records of the text-based file, the human-readable allele designation of the third text line comprises a number of attribute -value pairs that specify a first SNP state, a second SNP state, an abundance count of the first SNP state, an abundance count of the second SNP state, and a strand of the nucleotide sequence represented in the second text line. 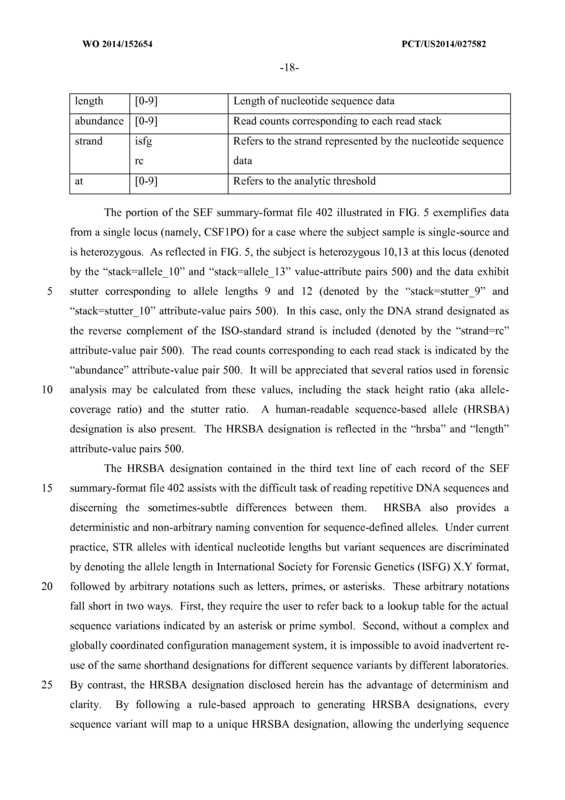 The computer-readable medium of claim 58, wherein, for each of the one or more records of the text-based file, the human-readable allele designation of the third text line further comprises an attribute -value pair specifying a reference SNP identifier associated with the nucleotide sequence represented in the second text line. 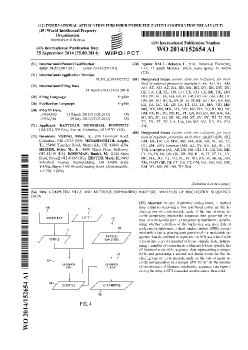 The computer-readable medium of any one of claims 57-59, wherein, for each of the one or more records of the text-based file, the first text line comprises a unique sequence identifier created by a massively parallel sequencing (MPS) instrument when generating data related to the nucleotide sequence represented in the second text line. 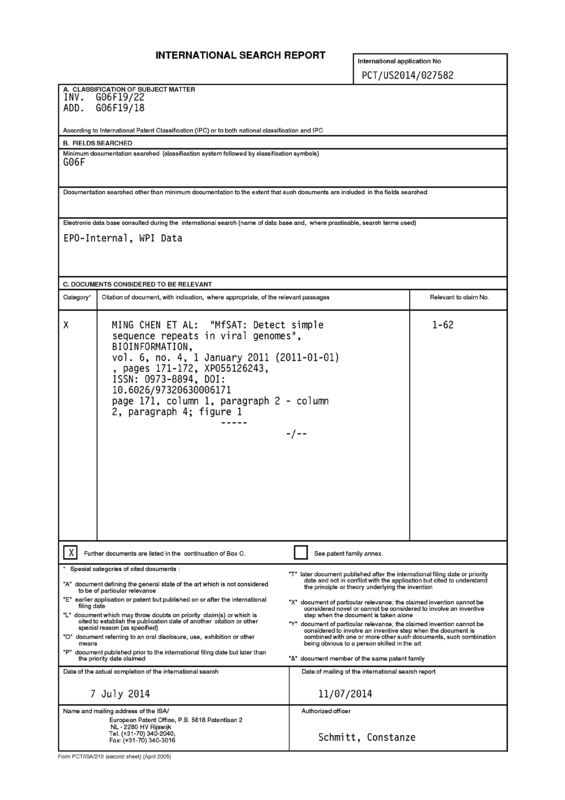 The computer-readable medium of claim 60, wherein, for each of the one or more records of the text-based file, the first text line further comprises forensic metadata specifying one or more of a file format, a unique case identifier, a unique sample identifier, a unique laboratory identifier, and a unique technician identifier. 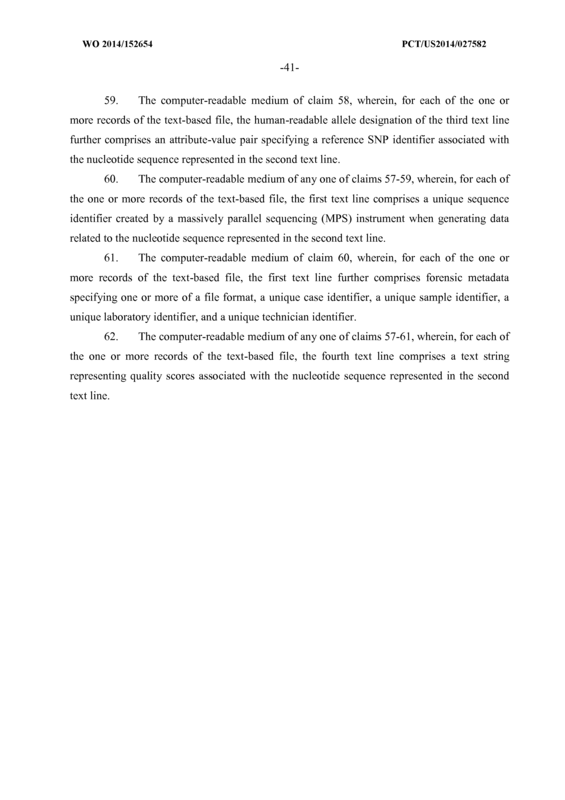 The computer-readable medium of any one of claims 57-61, wherein, for each of the one or more records of the text-based file, the fourth text line comprises a text string representing quality scores associated with the nucleotide sequence represented in the second text line.